It’s here. Reveal day. I’ve been posting sneak peeks on Instagram all week and I’m so excited to finally share the whole thing! This reveal is a little more exciting because 200 bloggers went on this journey with me, and we all have something to share. If you head over to Calling It Home you can see the featured designers today (Wednesday), and tomorrow the linking participants will be posting their rooms. These past two weeks have been nothing but getting this room done, so I apologize to all my regular readers that have been looking for cleaning tips every Tuesday because I haven’t shared any in two weeks. My house is currently in a state of disarray from trying to finish up this room, so I’m not even going to pretend I’ve been cleaning anything. No worries. I’ll be back on track for next week. I had several goals for this room, so I’ll go through each of them, and then show the full room at the end. Sound good? The first goal I had for this room was creating a football field wall. As you can see from the above picture, the wall was painted green… about three years ago when I first had this idea, and there it sat… for 3 years. Green. Over the past few days, I figured out how to use my new Cricut (and luckily, it was incredibly easy) and I created a football field. For the full tutorial, click HERE. When I first started out with ideas for this room, I was hoping to find a “locker type” dresser. Instead, I found an actual locker. You can read all about how I turned a locker into a dresser HERE. This room had nothing on the walls, except for maybe some dust, grime, and bright blue paint. In week 4, I painted those blue walls and showed you how I made a “football formations gallery” using my son’s own (made up) creations. 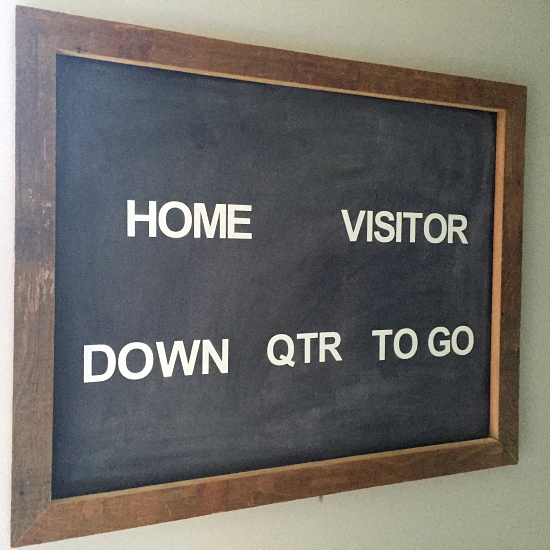 The last addition was this chalkboard scoreboard. This project was not originally part of the plan, my husband found an image on Pinterest showing how someone had turned their bi-fold closet into, what looked like, a locker bay. You can find the tutorial for this project HERE. Since we took out the old dresser, we needed a nightstand so he would have space for his lamp and clock. Again, not an original goal for this room, but a necessity after finding a locker without any surface area. 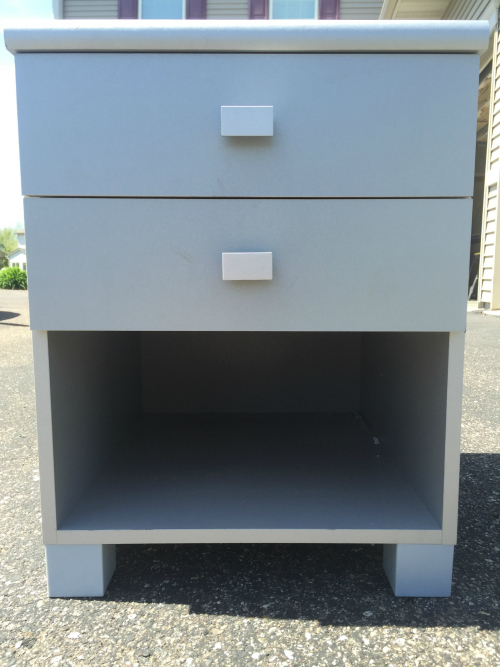 I headed to Goodwill, and found just what I was looking for… and it was a whole $5. Can’t beat that. The only issues are that I’m not a fan of the shiny, silver, laminate-countertop coating, nor the plastic feet and plastic pulls, but I do like the shape. I removed the feet and pulls, but I haven’t been able to paint it because it has been raining… and raining… and raining around here. I’m hoping to share this last piece of the room next week… or 1 1/2 years later 🙂 (You can find the tutorial here.) The nightstand should also provide a bit of the storage I was hoping for at the beginning of this challenge. Stars, planets, and spaceships don’t exactly scream “football”, so I searched for bedding options and found one I LOVED at Restoration Hardware, but I couldn’t justify the $228 pricetag, so I went to Target, and found a navy comforter and some gray patterned sheets. I think they’ll do just fine. Even though this hasn’t been completed, I did buy all the supplies. Thank you so much for stopping by. 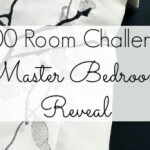 I will be going through all 200 One Room Challenge posts and sharing my favorites in two weeks from today. 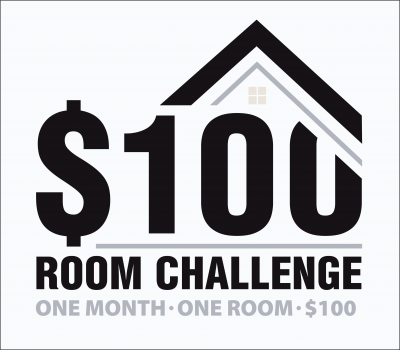 Remember that another $100 Room Challenge starts up the first Wednesday in June (June 1st), so I hope you’ll join me for that. Now head on over and see what everyone else decided to do with their spaces! 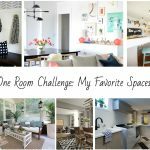 One Room Challenge: My Favorite Spaces! A football fan’s dream room. I love the football field wall. 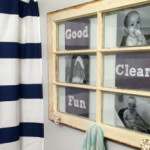 I wanted to let you know that I am featuring this with a photo and link on my site at http://www.simplycreativemoms.com/boys-bedrooms.html if you don’t mind. Awesome room!! Man would my little guys love this! Love the football wall and I’m guessing your son loves it all too! Thank you so much Coco. This room was so much fun to work on. I love kids’ spaces! 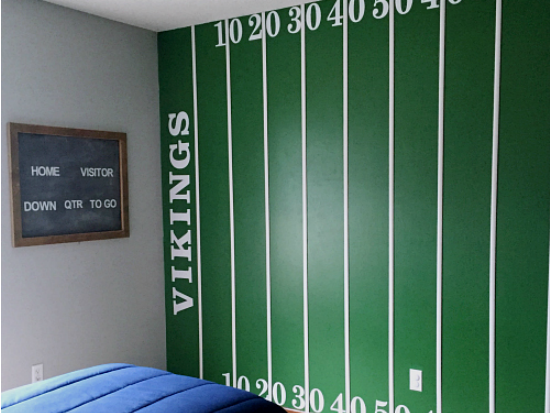 Erin, I’m so sorry I didn’t get over here until today to check out Isaac’s football bedroom – it turned out awesome! You must be so thrilled to have it done and I bet Isaac is crazy excited about it too. I especially love that football field wall and the locker you found for the dresser. It’s so clever how you guys turned the bi-fold closet doors into “lockers” too. Great work! No worries! I’m going through all the challenges in order so I don’t get lost. I’m on 94 and I think you’re 96, so I should be over shortly 🙂 Thank you for all you kind words on this room. It was so much fun to create. The football wall is so fun! 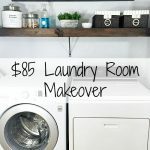 Great budget-friendly makeover! Oh wow – I had no idea all this was done for less than $300 – it’s amazing! That football wall is genius, and I love the locker/dresser. He’s a lucky guy! Thanks Lizzie! I’m always, always looking for budget-friendly ideas. I think they force me to think a little more creatively. Isaac’s room such a fun space to work with. Thanks Wanda! The football wall certainly makes the room, and I love that Isaac got to take part in creating some of the elements in his space. Erin, that wall is ah-mazing! So good. Love all the thoughtful touches. Well done. I love that you stuck to a realistic budget. I did mine too on a uber tight budget so I know just how hard that is. It really puts your creativity to the test! You succeeded for sure. The locker closet doors are so creative they make me smile and the football field wall is a boys dream. well done. Thanks Jenny! Since I don’t have unlimited funds, I actually love the challenge of working within a small budget. I certainly think more creatively. Excited to check out how your room turned out… I’m slowly making my way through all the rooms… there are SO many great ones out there! I love it, love it, love it. Two things I would add: Isaac’s name stenciled on the real locker or a closet door. And a tv so he and his friends could watch the game, keep up with the yardage on the chalkboard, and actually work plays with dry erase markers on the field. (You did seal this wonderful wall, didn’t you?) This room is a treasure. Thank you so much Jewell! This room was such a joy to work on. How fun! Your son must be so happy! 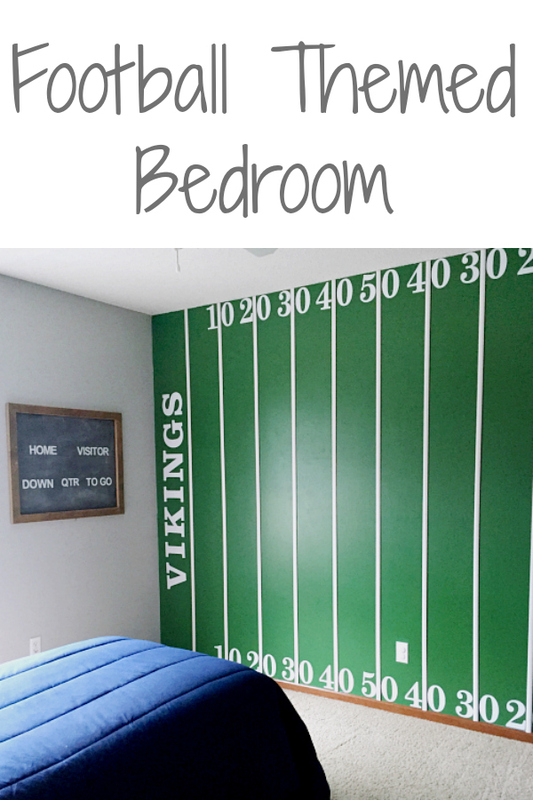 My boys are obsessed with football so they would go crazy over this room! Well done! I love it Erin! I’m always so impressed with what you can get done with just $100! Thanks Iris! It’s always fun to see how far I can stretch the budget. Nice to have a bit more to work with this time around, but still had to think creatively to get this room done under $300. Love it! And that wall is just WOW!!! What a great room, Erin! The closet doors as lockers is such a great touch, and the field wall looks very realistic. 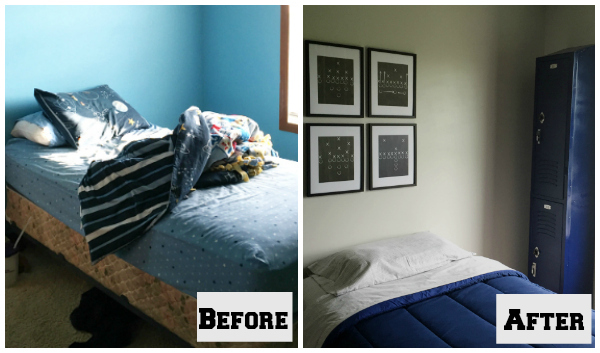 Wonderful transformation on a small budget–nice job! Thanks Sharon! This was a pretty fun space to work on. I think kids’ rooms allow for a bit more creativity so you can let the imagination work a bit more. What a cool space! 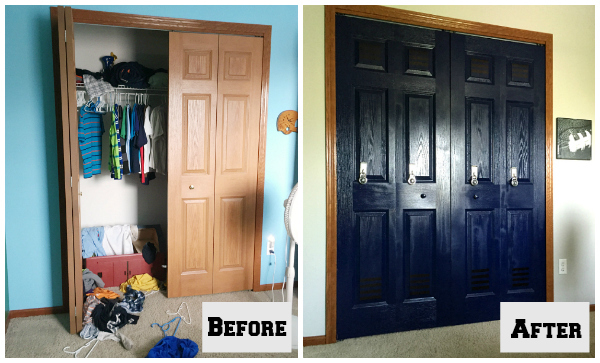 I love how you turned the closet doors into locker doors! Job well done on the room! Thanks Jenny! I was actually pretty impressed with how easy those closet doors converted over to a “locker bay”. 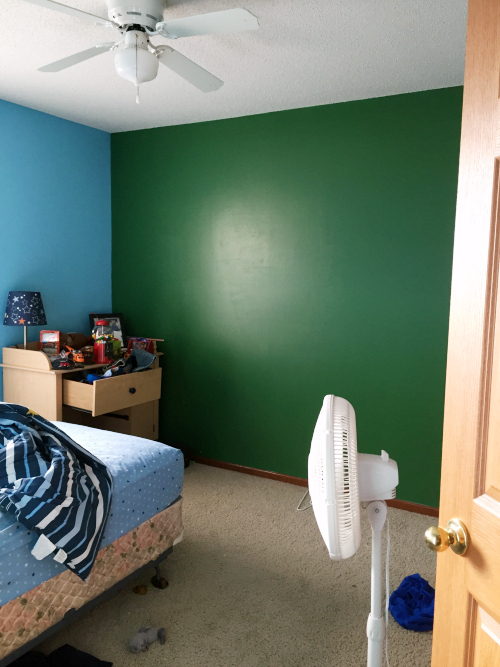 I love how it turned out-I bet he is thanking his lucky stars his mom is so talented and chose to makeover HIS room! Thanks Delia! This was such a fun space to work on. $166! That’s uber impressive. Love the lockers and the artwork with the plays on them…SO cute! And the door pulls? Genius! Thanks Heather. I thought those door pulls were a pretty fabulous find by my husband as well. … Somehow I’ve got to make my final budget stand out more. The $166 was where I had left off last week, and the final budget ended up being $280… still a pretty good budget for everything we did, I think. Again, I just love the concept of doing this kind of challenge on the cheap. 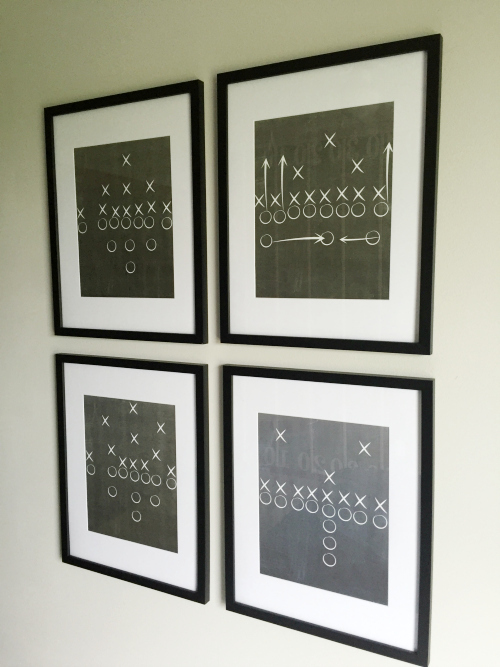 The DIY football field is so well executed…and everything else for only $166! What an inspiration. Congrats, Erin. Thanks Mila! I was so excited with how that football wall turned out, especially being that I’d never worked with vinyl before. I just said in the comment above that I need to make my final budget stand out more… while I would have loved to have pulled all this off for $166, that was actually what I’d spent up to this week. The total ended up being $280, which I still think is pretty good for everything we ended up doing in here. Great job Erin! Any boys dream is to have a room that reflects their sports taste! This is full of character and fun! I am hosting a new link party, Sweet Inspiration and hope you can join us. It runs from Friday till Tuesday! Thanks Mary! This was so fun to work on, and Isaac is, for sure, a huge sports fan, especially football, so this room truly reflects that. Thanks for the invite to your linking party. I’ll check it out. Another Super Bowl -worthy job Erin! Love the wall field!!! Your son must be ecstatic!!!!! Congrats and cheers to us for another room DONE! Thanks Vel! I’m pretty happy with that wall. This room was so fun to work on. Thanks Elise! I think they add a fun dynamic. Your son’s room looks awesome Erin! 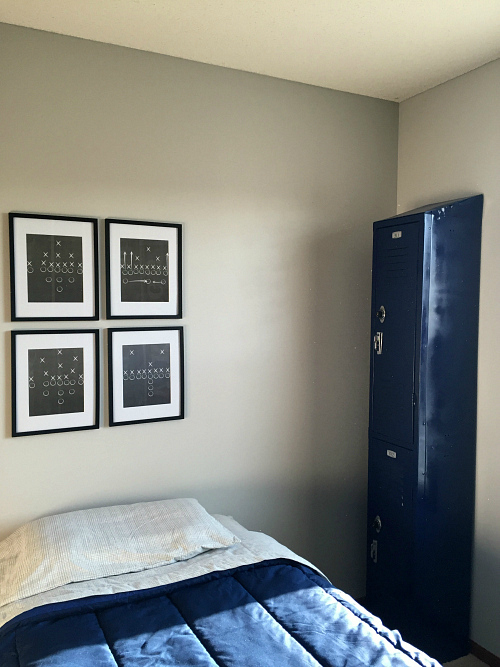 Love the prints you hung and the locker room closet is so creative and looks great! You can’t beat the price of his makeover either! Great job! Thanks Tara! I was fun to let Isaac create his own artwork for the space. I wanted him to feel he had a part in the creation of his room. Thanks Kendra! 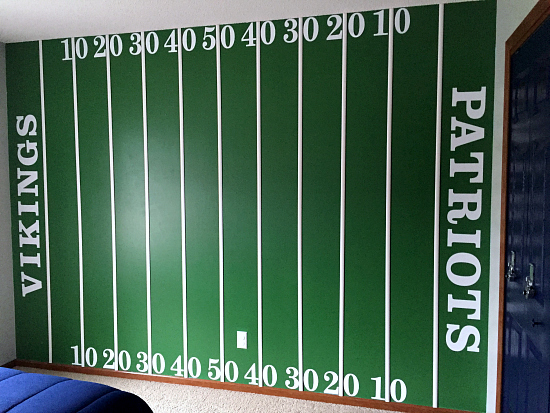 It’s kinda fun to work with a theme, and where else I am going to get to create a football field wall in the house? What a great concept for your son’s room! I love how it turned out and for such an impressive budget!! Amazing! Thanks Krystle! It’s always a challenge to work within a budget, but I often find there is SO much you can do, even with limited funds. As a fellow Minnesotan you had me at Vikings! What a fun space that I know my boys would love. That wall turned out amazing! Great job! Thanks Tammy! So fun to hear that other readers are close by. I love it! That field wall turned out great! Your son must love it! Thanks Danielle! I am so happy with that football field wall. I was so worried about it at first, but a few hours of cutting and hanging vinyl, and it turned out pretty well, I think. What a neat wall! Such a great room for kids! Thanks Sabrina! I was worried about that wall, but I’m pretty excited for how it turned out in the end. This room is great! LOVE the football field wall and the lockers! The foot ball field wall was perfectly done! I love the lockers decor, thats genius, the whole idea is planned beautifully! I am sure your boys are over the moon for this. Thanks Maria! This was such a fun space to work on. While I’m typically not a “theme person”, it sure does work well in a child’s bedroom. What a great boy’s room! That football field wall is so awesome. Definitely pinned for reference when my little boy gets to be a bit older. Thanks so much for the inspiration! What a fun room! I don’t have boys but I bet yours is super excited with this. Congrats! 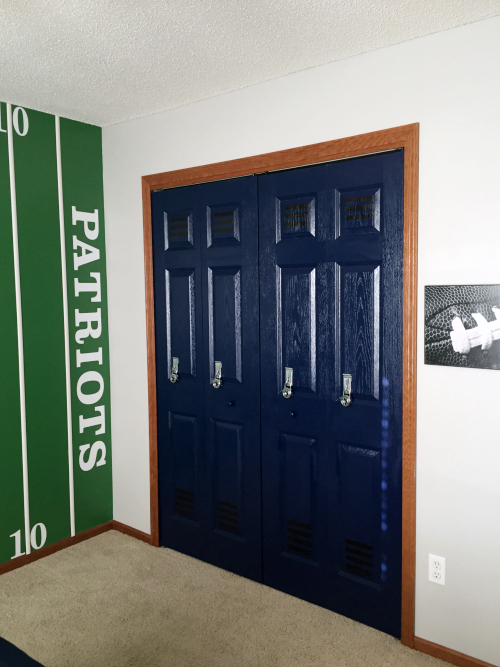 My son is seriously the biggest football fan ever, so this room is perfect for him. I’m just hoping he still loves football for years to come, because this room will not be changing again for quite awhile. You had me at VIKINGS!!! SKOL! 🙂 What fun to see your results – and to know you did it on a very small budget is SO VERY IMPRESSIVE! I love design that looks like a million bucks but wasn’t! Go you! I bet your little man is quite happy!!! Cheers! I love trying to create a big impact on a small budget. It always makes me think outside the box and get creative. This was such a fun room to work with. Thanks for stopping by! Erin – Your son is one lucky boy! 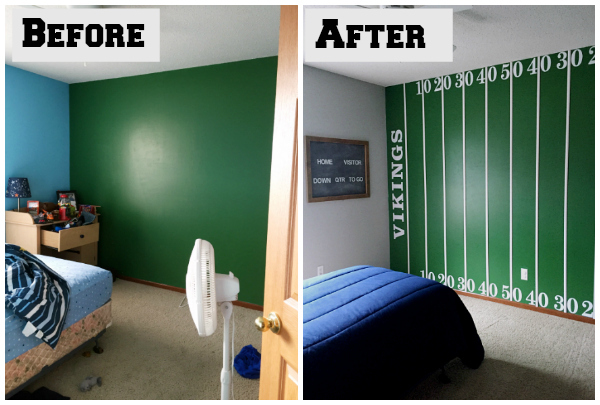 His football room transformation is so creative! Cheers to a job well done! Thanks Ladies! It’s always fun to work with kids’ rooms. You can do things a bit more creatively/”out of the box”. 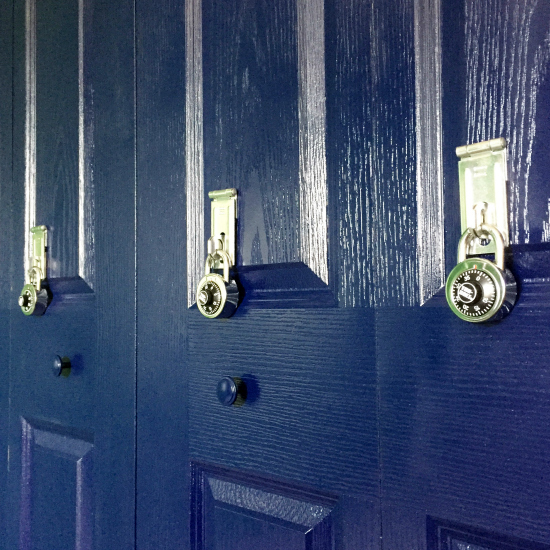 The locker doors – such a fabulous idea! Great before and after Erin! Thanks Ashley! Although my husband is not one to search Pinterest very often (or ever), I was so glad he found the inspiration for closet. It worked out perfectly in this room. The football wall is awesome! I had to show that to my husband, he loved it too! Great job! Thanks Roxanne! I think this room is definitely appealing to the football lovers out there. 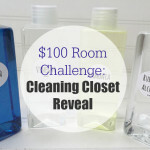 I still love the idea of the $100 challenge. I definitely have to try it. But I do love how fun this room turned out. I love the details like how you turned the closet doors into faux lockers, such a fun idea! And anytime a real locker is used, I am most likely going to be a fan! I have to say that I LOVE doing the $100 Room Challenges as well, but it was nice to have a bit more money to work with for this room. 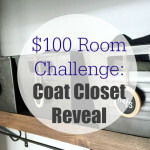 I’m starting another $100 Challenge for June. If you decide to try it, let me know! Have a wonderful day! 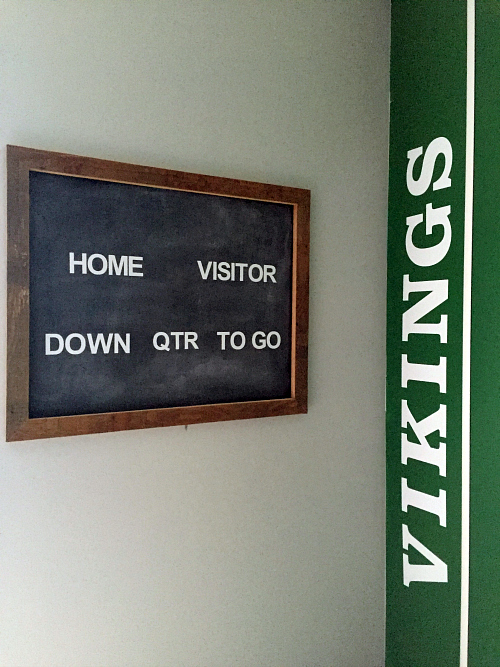 Such a cute space – as a football AND Vikings fan, I’m in love. The frame plays were such a great idea – love them! Thanks Melissa! I’m definitely part of a football-loving family. 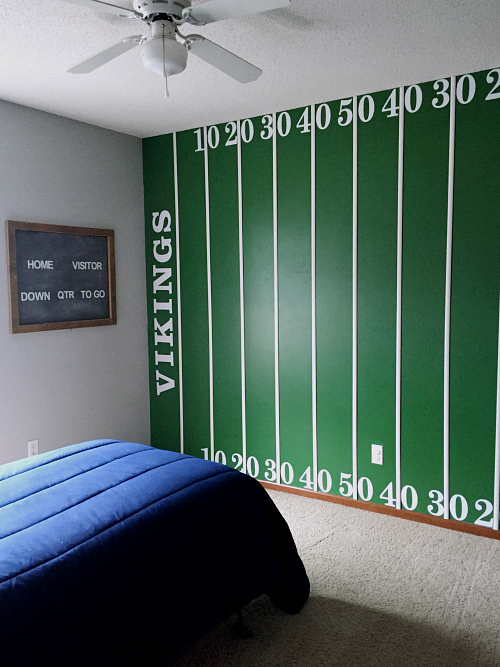 I think my husband would love a football themed living room, but I think it works a whole lot better in a boy’s bedroom. Fun to do another ORC with you! This is amazing Erin! Your boy will LOVE it! I can’t believe how cheap,y you did it too! Awesome job my friend! Thanks Lindi! This was such a fun room to do. and Isaac loves it (which is a good thing)… and I’m always looking for ways to keep expenses minimal. That football wall is just awesome!! I bet your son loves it! Great job! Thanks Amanda! I think I have had my fill of vinyl wall clings for awhile, but I’m so please with how it all turned out. Way to go Erin! This, along with your other room make overs, is GREAT! 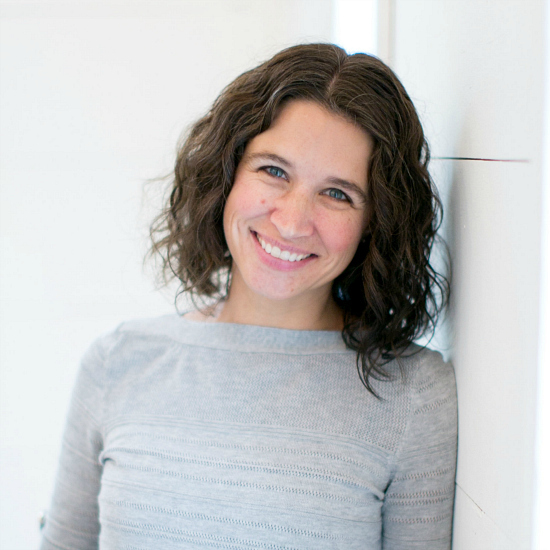 You are so creative, frugal, and yet are able to accomplish wonderfulness! This is so fun to watch the progress! Keep up the good work. I look forward to seeing more! I bet Isaac is thrilled!! Thanks Laura! Isaac seems to like how everything turned out. He got to choose which teams he wanted in the end zones, and do the “artwork”, so it really is his space. Awww… thanks Amy. Can’t wait to check out your room! This was such a fun room. I’m typically not a “theme-y” person, but with kids, you can get by with it. Thanks for stopping over Nicole!